According to the American Stroke Association, about 795,000 Americans suffer a new or recurrent stroke each year. That means, on average, a stroke occurs every 40 seconds. A stroke occurs when a vessel in the brain ruptures or is blocked by a blood clot, and while medical advances in stroke care have come a long way in the last decade, acting fast in the event of a stroke is still one of the best ways to help improve your chances of recovery. 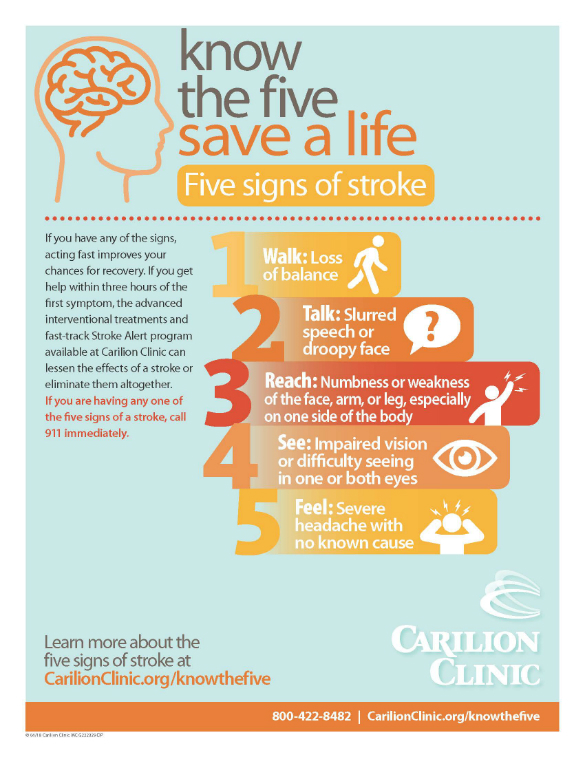 If you get help soon enough, the new interventional treatments and programs such as Carilion’s Fast-Track Stroke Alert program can lessen the effects of a stroke or eliminate them altogether. Do you know the signs of a stroke? Take a look at the infographic below to find out. And remember, about 80 percent of all strokes are preventable. Work with your doctor to get hypertension and high blood pressure under control, stop smoking, eat right and exercise.